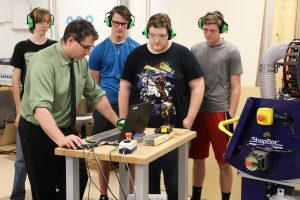 JM Fab Lab instructor Tom Romick teaches (back row from left) Conner Dobbs, Peyton Berner, Dustin Hall and Nicholas Parker how to program the ShopBot for an engraving project. A “Grand Opening” was held Wednesday morning at John Marshall for the school’s new Fab Lab. JM is the first and only school in West Virginia to have a certified MIT digital fabrication makerspace. The John Marshall High School Fab Lab was funded entirely by state and private grants. Students began using the facility at the beginning of the current school year. The “Grand Opening” was held now because students have had the chance to complete several Fab Lab lessons and this reception showcased some of those student projects. A Fab Lab is designed to expand students’ skills in Science, Technology, Engineering and Math (STEM) education and provides teachers the tools to engage students. Fab Lab lessons encourage students to be creative and learn to problem solve while realizing there are several ways to complete a task. The Fab Lab is a platform for learning and innovation: a place to play, to create, to learn, to mentor and to invent. The goal is to prepare students for a career in Engineering and jobs in Career & Technical Education fields after graduating high school. JM’s Fab Lab is even open to the public once a month. On Saturday, May 12, 2018 from 1 pm until 3 pm community members can engrave a drinking glass, vase or other glass items for a small fee. There are only 15 spots available. To participate, call 304-843-4444.